Washington, D.C., is distinctive among United States metropolitan areas and not just because it serves as the nation’s capital. Trailblazing pioneer settlers established most American cities, based primarily on proximity to a water source or other natural resource, a railroad throughway, or on tourism values. 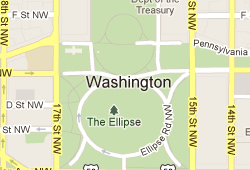 Washington D.C.’s origins came about differently. In what may have been a symbolic gesture to show the infant country’s solidarity and confidence in its relatively new governmental system, the founding fathers reached political compromise to establish the country’s capital city. While the Constitution allows for the establishment of a seat of government, no specific location was indicated. In the Compromise of 1790, Thomas Jefferson, James Madison and Alexander Hamilton agreed that each state’s Revolutionary War debts would be paid in exchange for establishing the new national capital in the South. Formed from land ceded from Maryland and Virginia (the latter was returned to Virginia in 1846) George Washington officially selected the site, beside the Anacostia and Potomac rivers, in 1790. Today, Washington, D.C., is home to more than 600,000 people and plays host to approximately 17 million visitors annually. In addition to all of the cool free things to do listed below, the city is a gastronomic center featuring more than 100 restaurants in its downtown area alone, excluding delis, take out and fast food; eight major professional sports teams, such as the Nationals (MLB), Redskins (NFL) and Capitals (NHL); and more than 40 theatre and performing arts venues. So, without further ado, here are the freebies (in no particular order)! The National Zoo is also, technically, part of the Smithsonian Institution’s cornucopia of attractions, but merits its own spot here. Fun for kids of all ages is the perfect cliché to describe the National Zoo. It houses more than 400 different species from the animal kingdom and, of course, admission is 100 percent free. You can participate in a free guided tour of the Kennedy Center Mon.-Fri. 10 a.m. to 5 p.m. and Sat.-Sun. 10 a.m. to 1 p.m., including the main theaters, sculptures and other artwork displays, and the Hall of Nations and Hall of States. Also, the Kennedy Center Millennium Stage, puts on a free show daily at 6 p.m. When the show is over, find an elevator that will take you to the rooftop of the building and marvel at a breathtaking, free, 360-degree view of the lights of D.C. The U.S. Capitol building provides free tours Mon.-Sat. 8:45 a.m. to 3:30 p.m.; however, you will need to acquire tickets, disseminated on site via a first-come, first-served basis. If you have to wait for tickets or for your tour to begin, or you just don’t want to take the tour at all, you can peruse the Capital Visitor Center’s myriad galleries and historical artifacts or watch the House and Senate at work via a live video feed. More uplifting than it is gloomy, Arlington National Cemetery allows you to stroll around its magnificently maintained, 624-acre grounds on a self-guided free tour or, if you’re so inclined, you can pay $8.75 per person for an interpretative bus tour. More than 330,000 Americans are resting in peace here. It’s open every day, including Christmas Day. Seasonal hours: April through September, 8 a.m. to 7 p.m.; and October through March, 8 a.m. to 5 p.m. Guards watch over The Tomb of the Unknown Soldier (also known as the Tomb of the Unknowns) 24 hours a day, and it’s worthwhile to take in the Changing of the Guard ceremony, which happens hourly (half-hourly in the summer). The National Gallery of Art provides numerous artwork displays, educational programs, lectures, guided tours, films and concerts at no charge. Explore the National Gallery of Art’s outdoor Sculpture Garden for some beautiful sights and refreshingly fresh air. Celebrating the varied aspects and colorful history of engineering, urban planning, architecture, design and construction, the National Building Museum offers free, direct, hands-on activities and exhibitions. The museum is open Mon.-Sat. 10 a.m.-5 p.m., and Sunday 11 a.m.-5 p.m. Free tours occur daily at 11:30 a.m., 12:30 p.m. and 1:30 p.m., depending on the availability of their qualified tour guides. On weekends, some of the museum’s professional staff members roll their Discovery Carts out for free educational presentations, primarily focusing on the fundamentals of construction. The Washington Monument is perhaps the world’s most famous obelisk, and as such, it is equally popular as a tourist destination. The good news is that admission to the monument is free, but you have to acquire a ticket. The bad news is twofold: It will cost you $1.50 per ticket, thanks to a service charge; and, if you’re going to try and get tickets at the monument itself (via the Washington Monument Lodge), you will have to be there before 7 a.m. because that’s when the line begins to form. You can reserve tickets on the National Park Service’s ticket website, or by calling 1.877.444.6777 for individual reservations, 1.877.559.6777 for a group. Peak season is April through September, and the Washington Monument page on the National Park Service’s website warns hopeful tourists that tickets tend to be reserved several months in advance. Here’s some free advice for those seeking to avoid the long lines or advanced planning involved at the Washington Monument: Check out the Old Post Office Tower, located at the intersection of Pennsylvania Avenue NW and 12th Street (about halfway between the White House and the Capitol building). At 315 feet, the tower’s observation level is about 240 feet lower than the 555-foot monument; however, it provides a similarly wondrous view of the city. The tower is open Mon.-Sat. 9 a.m.-5 p.m. and Sunday 10 a.m.-6 p.m. from Labor Day through Memorial Day. Beginning on the first weekend in June and running through Labor Day, the tower’s open hours are Mon.-Sat. 9 a.m.-8 p.m. It closes at 7 p.m. on Thursdays during these months due to bell ringing practice. Oh yes – it’s free. If you want to attend one or more of the U.S. Supreme Court’s free public lectures, you just need to get there Mon.-Fri. 9:30 a.m.-3:30 p.m. on days when it’s not sitting. You will probably want to get there early, though, if you want a seat because they are only available via a first-come, first-seated basis. Visitors wanting to attend oral argument sessions can surf on over to the Court’s website for a detailed schedule. You can (and should) visit the U.S. Botanic Garden regardless of whether it’s raining, sunny or any other weather pattern you can think of. Permanent and seasonal exhibits are on display in the garden’s on-site conservatory; home landscaping demonstrations are on display in Bartholdi Park, located right across the street (Independence Avenue) from the garden; and the relatively new National Garden, which opened in 2006, is a magnificent experience in and of itself. National Garden: daily, weekends and holidays, 10 a.m.-5 p.m. The Conservatory: daily, weekends and holidays, 10 a.m.-5 p.m.
You don’t have to be a history buff to recognize the dubious distinction Ford’s Theatre holds as the place where, on April 14, 1865, President Abraham Lincoln was shot by the notorious John Wilkes Booth and later died across the street. The theatre closed its doors after this monumental albeit tragic event, shutting itself off from society for more than 100 years. It never completely went away, however, and in 1968, Ford’s Theatre reopened as a working theatre, thanks to a public-private partnership operated by the Ford’s Theatre Society and the National Park Service. Admission is free; however, tickets are required. The theatre’s box office hands them out on a first-come, first-served basis when it opens at 8:30 a.m. The theatre itself opens at 9 a.m. and cuts off admission at 4:30 p.m. The Daughters of the American Revolution Museum shows various American historical objects in more than 30 period-focused rooms, exhibiting primarily furniture from the country’s colonial era. The museum gallery’s hours are Mon.-Fri. 9:30 a.m.-4 p.m., and Saturday 9 a.m.-5 p.m. This one comes with a caveat: You can take a free tour of the White House; however, you have to arrange it through a member of Congress at least one month in advance. These tours run Tues.-Sat. 7:30 a.m. to 11:30 a.m. The White House Visitor Center, however, is open to the public every day from 7:30 a.m. until 4 p.m. You will find it on the southeast corner of 15th and E streets. Free guided tours of the Library of Congress’ Thomas Jefferson Building can be taken Mon.-Fri. mornings at 10:30 and 11:30 a.m., and in the afternoons at 1:30, 2:30, and 3:30 p.m.; Saturday hours include 10:30 and 11:30 a.m., and 1:30 and 2:30 p.m., excluding Inauguration Day and Martin Luther King Day. The tour brings you to a number of awe-inspiring rooms in the Thomas Jefferson Building, such as the Main Reading Room, the Great Hall and several galleries. If you are thinking about buying or selling a home, give us a call at (503) 495-3561 or send us an email to explore your options and to find out when is the best time for you to make a move.